Why doesn’t Russia’s army use actors for drills? 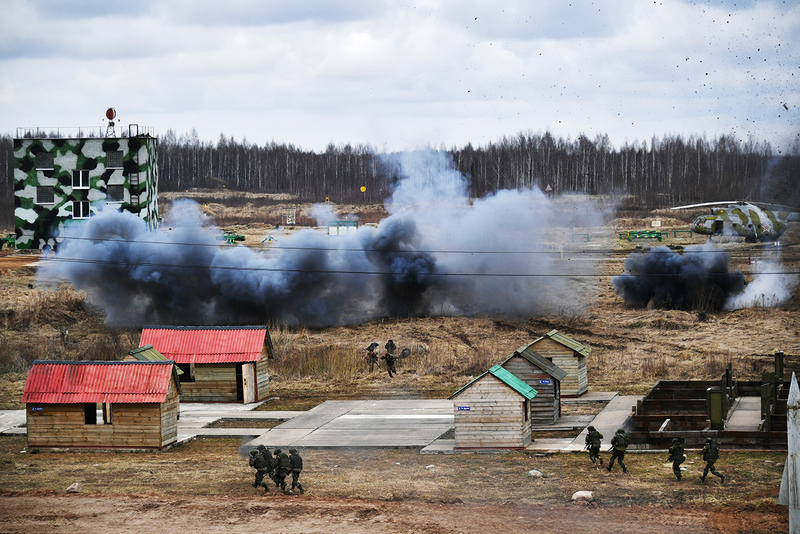 Servicemen during a Russian-Belarusian exercise of airborne tactical units. Germany uses extras for civilians but Russia prefers to adopt technology. At the end of March the German media reported on an interesting new career opportunity: extras to take part in military drills. If this wasn’t strange enough, actors are expected to play Russian civilians – adding a sharp political edge to the role – apparently in a bid to create realistic conditions for the German military. Russia’s army doesn’t adopt such techniques to practice the art of war, but it does have its own unique way of conducting military exercises. In the past, Russian soldiers taking part in drills would be transported thousands of miles to Siberia or the Far East, together with the heavy equipment and armored vehicles. However, this is a very expensive process and highly impractical. What’s more, unlike the Germans it seems, Russian soldiers do not practice launching strikes on civilians, so there’s no need to hire extras to act as innocent bystanders. In the past Russia’s Armed Forces used decommissioned technology as targets during combat drills, however, a new range of targets has been specially designed and they’re cheaper – and considerably lighter – than spent tanks and out of service army vehicles. A special enterprise prepares inflatable combat technology dummies for the Russian Armed Forces, and they’re not just big toys. The assembly line produces fully-fledged technological equipment. The tank dummies, for example, are made of a special material based on rubber that makes them practically undistinguishable from the real thing from a distance. Inflatable technology is also used on infrared ranges. The technology used make the special inflatables can create a replica of any combat vehicle. This method not only limits the use of wood and other heavy materials, but also makes each drill far more realistic so soldiers are fully prepared to use (and counter) the latest technology in modern warfare. The Russian Army has always carried out exhaustive drills, often to demonstrate the ability of the soldiers and their equipment. Usually high-ranking officials would watch and in pre-revolutionary Russia the tsar would attend to see the Imperial Army's combat skills and organization for himself. Military drills obtained a special significance during the Soviet Union. In the 1930s the USSR was one of the first to conduct large scale exercises involving parachute troops. In 1935, as part of the exercises in Ukraine and Belarus, Soviet and foreign generals saw the descent of 3,700 and 5,700 parachute troops, respectively. The effect was so immense that the European media caught on. No other country in the world could do anything similar back then. After WWII, drills in the Soviet Union were carried out in accordance with all the canons of military science. In the early 1950s, the superpowers developed their own nuclear weapons in the wake of the two fission bombs that were dropped on Japan in 1945. In 1954 the USSR held massive drills at the Totsk firing range in Southern Ural. In order to verify the consequences of a nuclear strike, kilometers of field fortifications and dozens of decommissioned combat technology were set up in the epicenter of the firing range. Roughly 45,000 military personnel participated in the exercise. The largest drill in the history of the Russian Army was the West-81 exercise in 1981 on Russia's western border. More than 100,000 military personnel took part in the event, along with thousands of tanks and combat planes. In its dimension the West-81 drill could be compared only with the enormous operations of WWII. Read more: Why is Putin expanding Russia’s armed forces to 1.9 million?